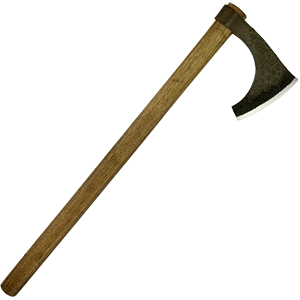 Axes have been used as tools and weapons both throughout history, and this weapon style is still utilized to this day. We offer an incredible variety of axes here at Buying a Sword, and we have split them into two different categories here: single headed axes and double headed axes. Our single headed axes have just that, a single head. They have one head historically intended for chopping, hacking, and cleaving. Our double headed axes are often of medieval origin or have a fantasy look to them. Make no mistake, these axes represent powerful weapons as well as useful tools. Our range of axes includes both functional axes for reenactment or rugged survival use and decorative axes to display as a phenomenal addition to any decor that is sure to spark conversation with all who view it. Shop all these high quality axes here at Buying a Sword. We carry a range of single headed axes here, including a variety of axes from different eras of history, different cultures, and for different uses. Whether you are seeking a Viking axe, a tomahawk, or a modern throwing axe, you will find it here. This category includes both decorative axes and functional axes, so you can find impressive display axes to hang in your home as well as functional axes that are ready to be used for reenactment or for rugged real world use. We carry a variety of bearded axes here as they would have appeared in different eras of history. We have Norse warrior axes as well as Frankish war axes, Danish axes, and other medieval European axe styles. You will also find modern day axes and tactical axes that are best suited for emergency situations, utility use, or preparing for a zombie apocalypse. If your weapon of choice is an axe, or you simply enjoy the features of one of our axes, why not browse through our entire selection of single headed axes? Two heads are clearly better than one when you are searching for an impressive axe! And at Buying a Sword, we have a great selection of double headed axes to choose from. 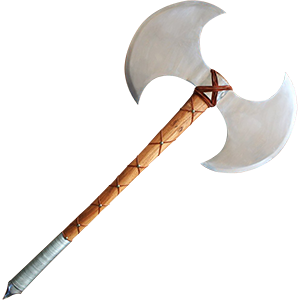 We have decorative axes and replica axes based on popular characters from fantasy, like Conan the Barbarian, as well as functional axes that are suited for historical reenactment, combat, or utility use. Shop here for battle ready medieval axes based on those used to combat heavily armored foes as well as tomahawks inspired by the colonial era of America. We also offer ornate double headed axes that are meant to serve as impressive pieces of home decor. When you are searching for a double headed axe, no matter the occasion or the style you need, be sure to browse through our double headed axe section here at Buying a Sword.